Well, we didn't intend to run a contest for cartooning those captions, but the entries we received were all amusing. The real reason our cartoons didn't print in the October issue was simply a technological glitch that both we and our printer regret. As we're coming to the end of the first year of transition from Mercury Press to Spilogale, I'd like to apologize for the various errors we've made---subscription mix-ups, more typos, and now these dropped cartoons---and say thanks to you readers for your patience and understanding. By far the biggest error in the October issue was the mistaken belief that Poul Anderson would live forever. Poul died just a few days before the first copies came off the presses. He was a scholar and a gentleman and his story "The Longest Voyage" left an indelible impression on a sixth-grade student I once was. Perhaps it's simply because Poul did seem eternal and his work touched so many of us, but there was a strong reaction in the sf community of feeling that the giants of the field are leaving us. Because sf and fantasy affect us so powerfully in our youth, I think we're prone to exaggerate such nostalgic sentiments. 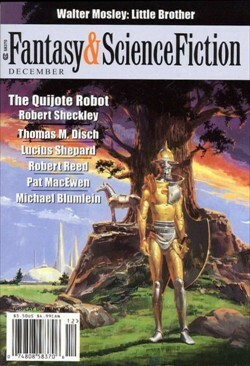 While we mourn Poul---and also his longtime friend Gordon R. Dickson, who died several months back---let's remember too that sf and its readers will remain eternally young so long as we keep our minds open to the wonders of the world.